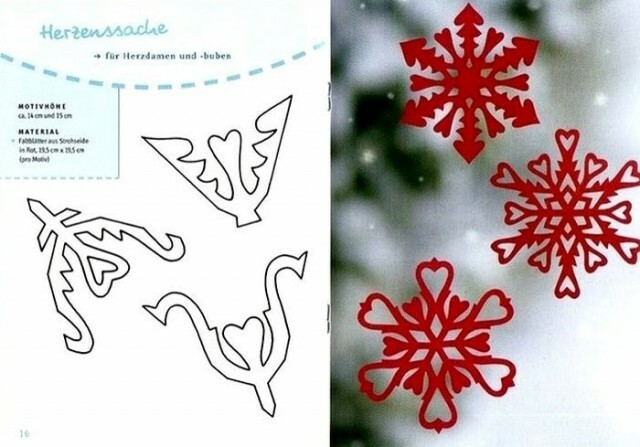 On the eve of New Year holidays, as well as the time winter vacation a great family activity, fun and a wonderful way to pass a free night can be cut snowflakes out of paper. The more that is needed to make a little effort, patience and your own imagination, and the material is always at hand. In addition the resulting product can always be easily applied as interior decoration, thereby creating a fantastic atmosphere in the house. First of all, it's desirable, to have sharp tips, with their help will be easier to cope with even the most intricate pattern. 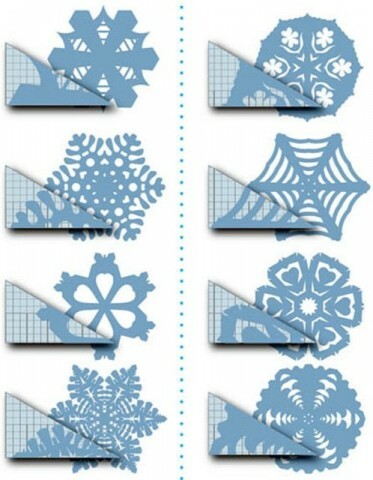 Secondly, if you're going to do a little snowflake, it is better to take a pair of scissors and a small size, and for the manufacture of large to fit almost any. Prepare sheet square shape, the required size. So, eg, in order to make the most out of a paper snowflake, if not at hand the material can be glued together multiple sheets. Take two opposite corners of a square billet, and add them together, so that a triangle. Then we determined with the, what kind of snowflake you want to get a result is more delicate and easier, this choice will depend on the amount of paper summations. 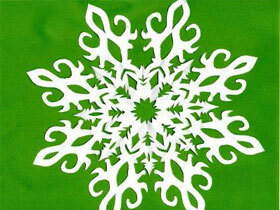 (For fine openwork pattern folded paper snowflakes need more time, than for a simple pattern.) Then turn off the snowflake, since it is described in paragraph two to get the desired result. In the next stage, we proceed directly to the very carving patterns on the workpiece. This can be done by eye or pre-painted on one or more edges of the folded blank of paper drawing, in the form of rectangles, squares, poluovalov or other figures. 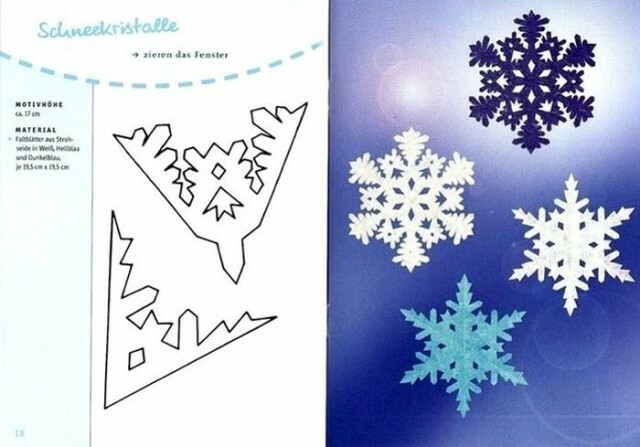 The process greatly facilitated, if the pattern to think in advance or find ready-made templates snowflakes out of paper, and to prepare them in advance. Pre-made blank will make several identical products. The final step is the accurate deployment of the product and smoothing it with the iron. 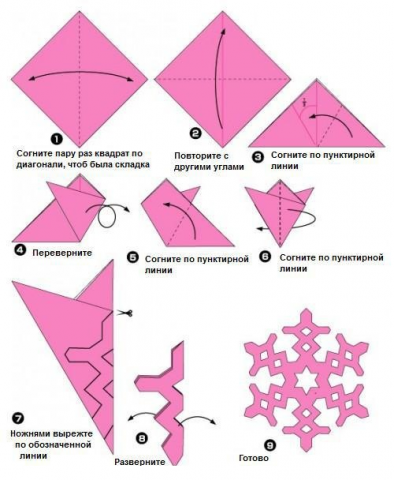 Templates below snowflakes from paper prepared by the square must be folded up, as in the previous scheme, but stopping at the point six. 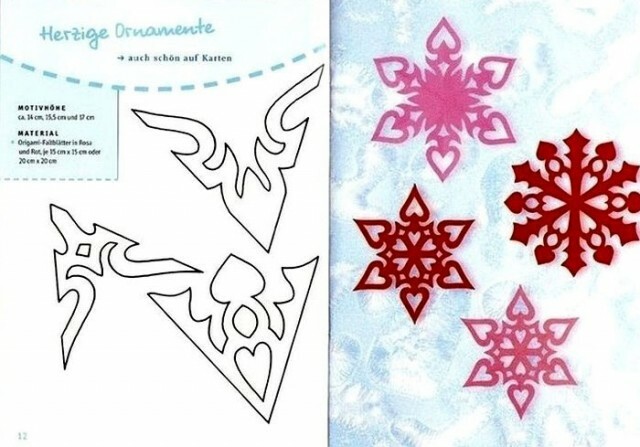 Then apply beforehand printed cut paper stencils snowflakes, cut around them and carefully cut along the planned lines. 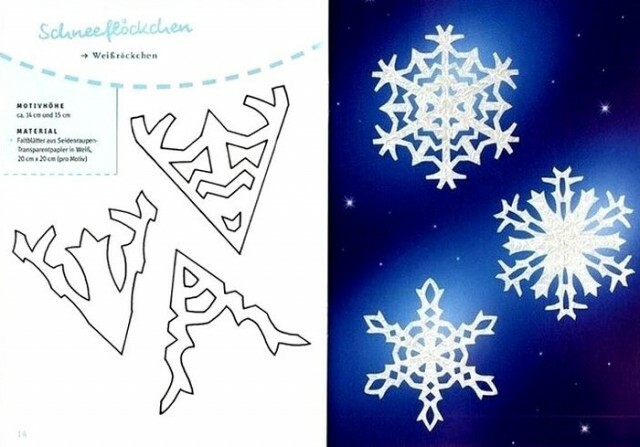 The result is a very beautiful snowflake shapes strikingly similar to the present. 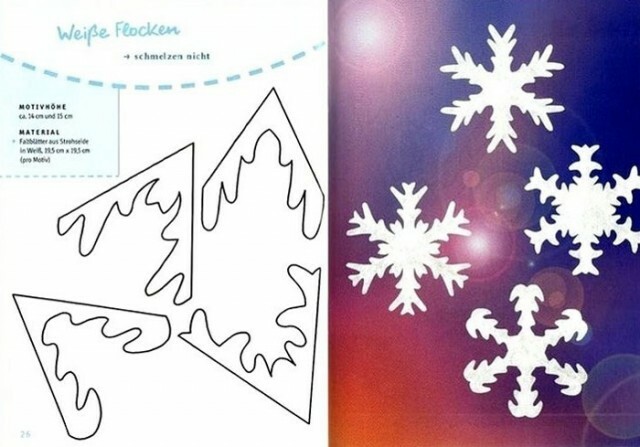 In addition to the simple thin openwork crafts you can make three-dimensional snowflake out of paper. 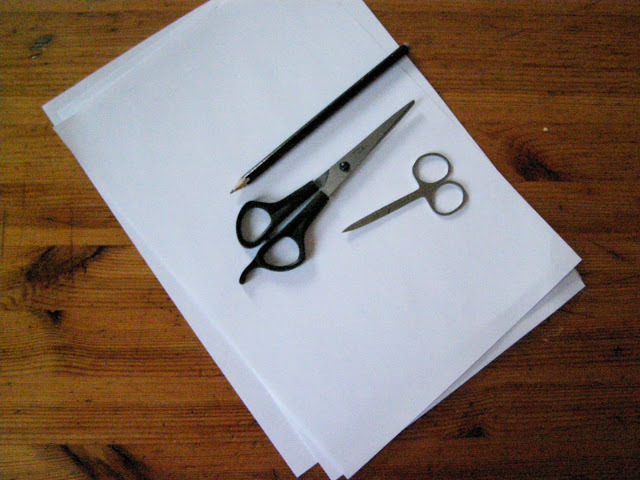 To this end, except for scissors, pencil and manufacture of the material will need office stapler or tape, and the line. Paper snowflakes volume is better to take a more dense, it may be a sheet or cardboard landscape. This will make the product more durable and more beautiful, but if there is no such handy, and fit a simple sheet. Take the square corners prepared and bend it diagonally, so that a triangle. Expand preform triangular base downwards. 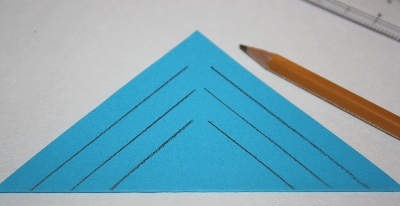 Use the ruler and pencil, retreating each time at a distance of about 0,5-1 See traceable line parallel to the sides, running in the direction from the base to the apex of the triangle. Lines may not reach the top and in contact with each other. By incised lines do notches and expand the square. We turn the workpiece so, To get a diamond. Then we take the right and left inner corners of the rhombus and fastening them with a staple or adhesive tape stationery. Overturn the product on the other side and proceed to the bonding of diamond over the next queue. Repeat the above described point until, until it is sealed with the last appearance diamond. As a result of this action and the results in the required initial billet. Once all of the crafts they will be ready to be connected with each other. To this end, the crimping of the edge of the first the first three elements, and then the remaining. After that the two parts are joined together obtained, so as to have something like a flower, and fasten them midway stapler, and a pitch at points of contact with each other. The result is a very beautiful product. 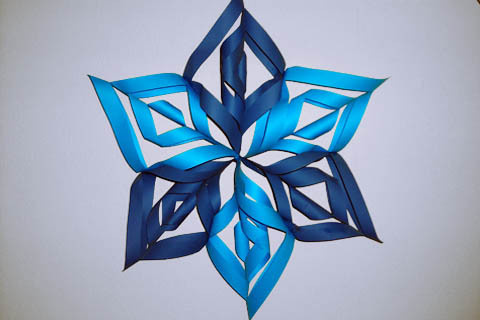 Making snowflakes from paper always was and will be a popular pastime, since the resulting product makes pleasing to the eye, It is a great decoration and to make it is not necessary to put an incredible amount of effort. How to make a collage? How to make a purse with his own hands? How to make a paper swan with his own hands?